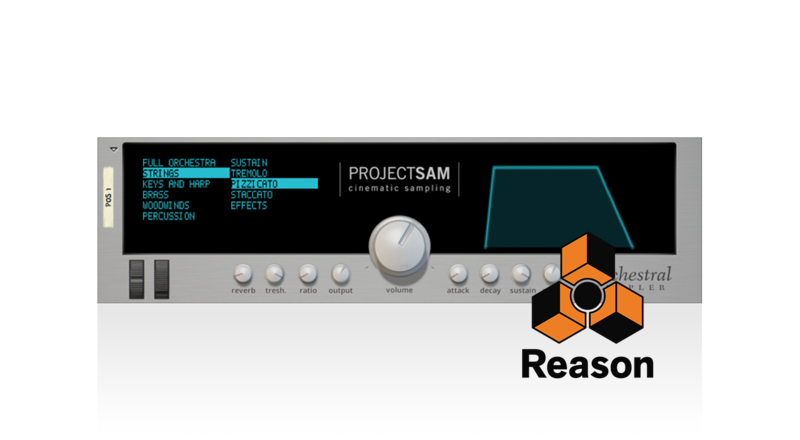 A light yet powerful selection of ensembles and instruments, taken from ProjectSAM’s renowned Symphobia Series, now programmed for Propellerheads Reason. ProjectSAM Orchestral Sampler is the light but powerful selection of ensembles and instruments taken from ProjectSAM’s renowned Symphobia Series. The Symphobia Series sound libraries are featured in countless blockbuster movies and games, used by industry-leading composers worldwide. Adjusted for the Reason platform, ProjectSAM Orchestral Sampler features string, brass and woodwind ensembles, orchestral percussion and a selection of common orchestral instruments such as concert harp, celesta and harpsichord. Version 1.2 adds a massive sounding orchestra + choir combo, epic drums and xylophone. ProjectSAM Orchestral Sampler gives you the tools to start composing your own movie score. Orchestral Sampler follows ProjectSAM’s successful ensemble recording philosophy. Strings, brass and woodwinds were sampled as sections, resulting in the authentic blend of orchestral instruments in a concert hall. ProjectSAM Orchestral Sampler puts the sound of a film orchestra at your fingertips. This item can be purchased on the Propellerheads website.